Don’t you love this time of year?! May is my favorite. We have a mile long want-to-do list for the house and yard, and now that the days are longer and the weather is nicer things are slowly getting crossed off. Last night I woke up at 2 am to a squeaking and rustling noise in my bedroom. After some detective work (while Jay slept soundly of course) I realized the squeaking was coming from a squirrel…inside the wall, right next to my pillow! Of all the walls in our house the stupid squirrel chose right next to my pillow?! So this morning removing the squirrel and replacing all of the crawl space/roof screens went straight to the top of the to-do list (yawn). I am so pleased with this quilt! The pattern for this quilt is Fat Quarter Friday, the squares quilt in the throw size, more details of the top are in this post here. I sent this to Kathy for quilting and she did a beautiful job. This dense popcorn/petal pattern adds so much dimension to a simple quilt. It’s so crinkly and soft! Because a lot of my quilts go to trunk shows or get donated, I rarely pull a new quilt out of the dryer to enjoy. The backing is a Moda print by Bonnie and Camille, and the binding is from my own line Hello Jane. Never a dull moment over at our house, that’s for sure! Such a pretty quilt! I feel your pain on the squirrels 😕 We have a family of flying squirrels living in our vaulted ceilings and walls…ugh…been woken up many a night with scratchings, scurryings, and squeakings. With no attic space, due to the vaulted ceilings, it’s really hard to get rid of them. Hope you are more successful with yours! Oh man luckily we don’t have a whole family, just one sneaky squirrel that got in through an open vent. We’re pretty sure we got the only one out…I think I’d go crazy with multiple nights of it with multiple squirrels! They are hard to get rid of if you can’t get to them! Sometimes I do quilt them myself…sometimes I don’t. Anything bigger than a large throw I usually don’t. 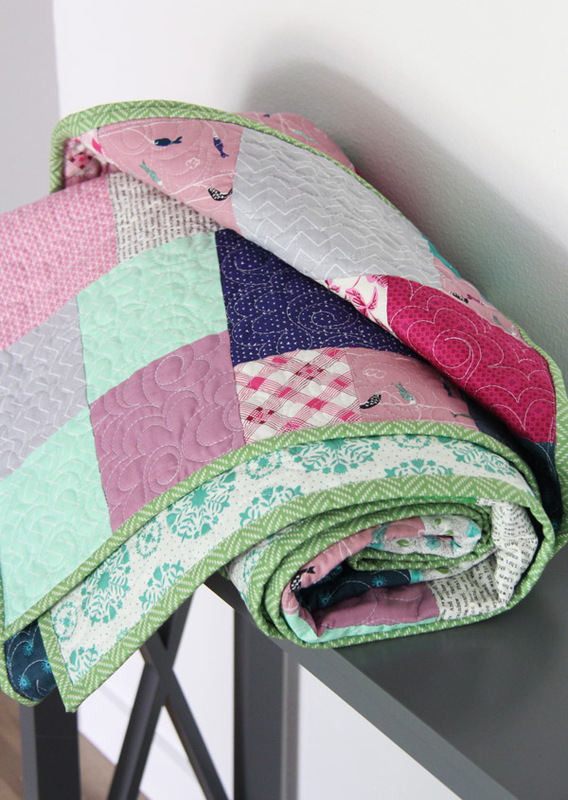 I used to have more time to baste and quilt all of my quilts myself, but as my kids get older I just don’t have as much time and space to spend on each quilt as I used to! Happy Mother’s Day to you too! We only just saw squirrels for the first time on our holiday to London. None in Australia. Your quiltbis seet and that lovely, just out of the dryer crinkle, is the best! 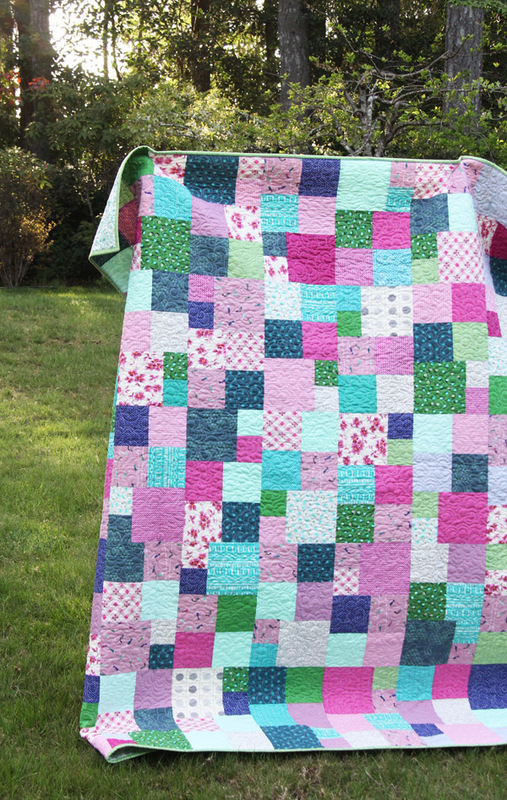 Lovely quilt.. . . Never had a squirrel but we’ve had a few possums …… Dam noisy things. .. Hope you are now squirrel proof……..
Loving the cooler shorter days here……. I just barely saw a possum for the first time last month…I didn’t even know we had them! We have tons of racoons in our yard, but they mostly leave our house alone. 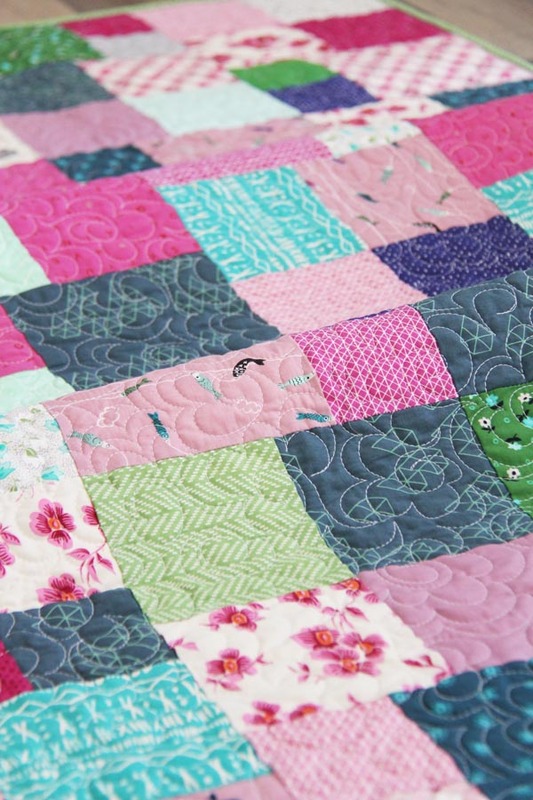 Love this quilt and your choice of colors mixing with the turquoise, purples, mint. It just speaks happiness! Great choice with the backing fabric as well. Sorry about the squirrel adventure! That would freak me out and have me sleepless for sure as I can barely handle seeing a spider in my house! Love your blog! Haha me to Julie…I think I’d rather a squirrel than a big spider, I can hear the squirrel coming! Thank you! Mice are worse…smaller and harder to catch I think! I’m thinking you have a typo. 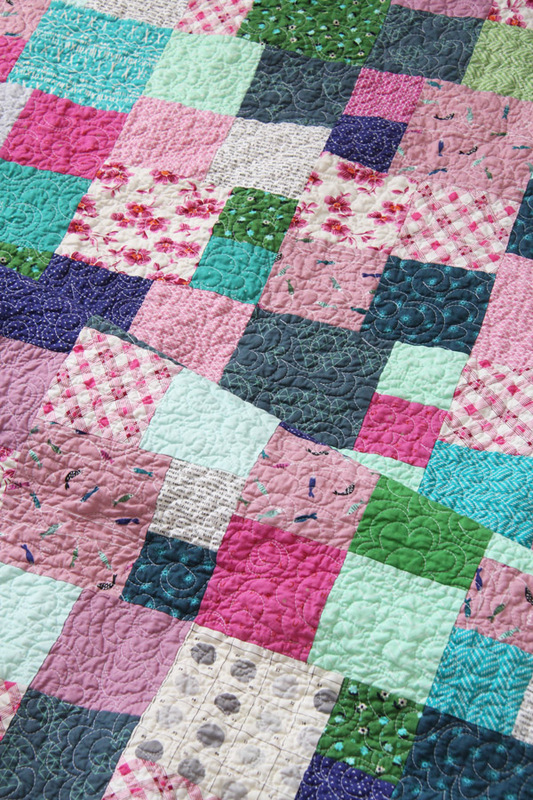 Awe…such a beautiful, bright and cheerful quilt. This is my kind of happy quilt I would wrap myself up to while watching a good movie late at night. I like the before and after look on the washing, what a change! Have a Happy Mother’s day. And I hope you kill that squirrel!